Helix readies for its playoff game on Tuesday. Behind a strong pitching performance, the Vaqueros took advantage of opportunities in the top of the sixth to score two runs and claim the road victory. With neither team able to put together anything offensively as the pitching was doing the job game moved to the top of the fifth scoreless. El Capitan changed that as Kylie Mead (1-2, RBI) led off with a walk, Madison Michalek-Rosales into run, Olivia Martinez laid down a bunt and was able to reach on an error and Michalek-Rosales took off for third base where she would end up, Martinez advanced to second on a wild pitch, Madisyn Wieher (1-3, RBI) laid down a bunt that scored Michalek-Rosales to make it 1-0. That would be all the Vaqueros would get in the inning. The Spartans in the bottom of the fifth inning started off with a lead single by Raylyssa Navarro, however, Mead was able to retire the next two batters but Navarro was able to advance to third base, with two outs Sabrina Figueroa laced a single which scored Navarro to tie the game 1-1. With the score tied 1-1 the Vaqueros didn’t waste time as Alexa Williams (2-3) led off the top of the sixth with a single, Taylor North into run, Bailey Olaveson (1-3) lined a single to right advancing North to second, a couple batters later with one out Mead helped her cause as she singled which brought home North and advanced Olaveson to third, Michalek-Rosales in to run for Mead. Having retaken the lead 2-1 the Vaqueros had an opportunity for more as Martinez bunted to advance Michalek-Rosales to second as Olaveson was held at third, with two down, Wieher hit a ball to second base that was misplayed allowing Michalek-Rosales to score to make it 3-1. Despite the lead single in the bottom of the sixth, the Spartans were shut down as Mead procured a double play and struck out the next batter to end the inning. In the bottom of the seventh, Mead would retire the side including striking out the first batter and also ending the game on a strikeout. Mead on the day for the Vaqueros tossed a complete 7 inning victory giving up 1 run on 6 hits while walking 2 and fanning 10 on the day. El Capitan with the victory will now travel down to the desert to take on the top-seeded Eagles of Southwest El Centro on Thursday for a 3:30 pm start. In dramatic fashion, the Highlanders scored all their runs in the top of the seventh to pull out the come from behind road victory over the Buccaneers. Mission Bay who came in as one of the favorites scored the first run in controversial fashion as the Highlanders thought they had caught what would have been an inning-ending double play, however, the umpires ruled otherwise and thus upheld the run score which gave the Buccaneers a 1-0 lead in the bottom of the second inning. As both teams held each other the game moved on with neither team doing any type of damage against each other. 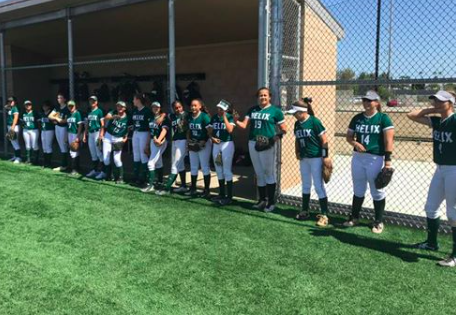 Helix knew they were running out of chances and in fact, were down to their last three outs as the game headed to the top of the seventh inning. The Highlanders got things going as Alofa Collins singled to lead things off, McKenzie Flores was able to draw a walk after working the count to advance Collins to second base, a couple batters later with one out Kasey Castro wasted no time and smashed a double on the first pitch offered which brought home Collins to tie the game at 1-1, Flores would advance to third representing the go-ahead run. With Flores on third and Castro on second, Coach Kowalski decided to make a hitting change as she brought in Laurali Patane to pinch hit, she laced a single to the right side allowing both Flores to come in from third and Castro to race home from second base to give the Highlanders a 3-1 lead. With two outs up came Nicole Hernandez who had nothing to show for her work on the day. In her first couple of at-bats on the day she had seen twelve pitches but on her third at-bat, she finally struck gold. She would take the very first pitch and hammer it over the right-center field fence for a two-run bomb and give the Highlanders some insurance runs as they now led 5-1. Leading with a four-run cushion in the bottom of the seventh Zoe Kuhlken went back out to the circle to try and end things. She would strike out the first batter but the second batter singled, the next batter grounded out to first for the second out. With two outs the next batter was able to get a hold of the pitch and rope it for a double that scored a run to make it 5-2. However, that would be all the Buccaneers would manage as Kuhlken jammed the next batter and Hernandez on the run fielded it and was able to throw it to first for the final out and the great play. With the victory, the Highlanders will now travel to the North County to take on the third-seeded Mission Hills Grizzlies.